In America we have a variety of religions and people are already familiar with the Christian Bible because we were founded as a Christian nation. The Bible and its precepts are still inscribed in stone on almost every state capital building and on almost every monument in Washington D.C. and scenes from the Bible and even the Ten Commandments are inscribed in the building of our Supreme Court. However, we have tens of Denominations of Christianity such as Catholic, Methodist, Baptist, Church of Latter Day Saints, Jehovah’s Witnesses, Lutheran, Protestants, Southern Baptist and a host of others. We have become so familiar with the majority religion and the MANY different translations and interpretations of the Christian Bible that we tend to approach all other religions the same way. There are two types of Muslims in America today. There are those who are Muslim in name or tradition only. Like many Christians in our country, they say they believe and follow their religion but it is merely a window dressing on their life and they don’t study it or try to live their life according to all the precepts of their chosen religion. In fact, if confronted with verses from their holy book, these religious people (Christians and Muslims) would be hard pressed to realize it was even from their book, let alone know what their religion teaches about it. I call these Muslims “Westernized”. Unfortunately, that term really applies to lots of religions in America and we have a lot of unprincipled people walking around pretending to be something they don’t understand. The other type of Muslim is a true worshipper of Allah and follower of Mohammed. I have met both, and the average American would not be able to tell the difference. Both treat people with respect (generally) and both speak English and are many times our next door neighbors or co-workers and fit right in to American society. Now let us look at two terms in the Quran. These are the two main things you must understand when studying Islam or speaking with a Muslim. If you don’t understand these two core Muslim doctrines then you are foolish to even begin to attempt a conversation about Islam. The two words are Taqiyya and abrogation. Let’s look at abrogation first as this word tells you how to read and understand the Quran. Understand that during the first 12 years of the writings, Mohammed was still a caravan robber and was building up his following. He lost some battles and retreated to Medina and sought help and refuge from three tribes of Jews and others who controlled the region. (http://www.cyberistan.org/islamic/treaty22.html) The writings during this time speak of peace and only fighting a defensive war. Most of the Surahs that speak of peace were written during this time when Mohammed needed protectors to defend him against the people who he had attacked, raped, murdered, and stolen from. The last words of Mohammed are found in the Quran Sura 9. This was the last Sura written approximately 631 A.D. before his death. If you understand these two concepts of Islam, then you have an understanding of their treatment of unbelievers or Infidels. Mohammed and Allah allow Muslims to lie about the so called “religion of peace” to lull you into a sense of safety. They are taught to make deals and treaties with the rest of the world when necessary. They are taught to fit in and deceive people when they are not strong enough to take power. Islam means submission and they are taught to bring the rest of the world into submission by whatever means necessary. Remember that the last writings of Mohammed were to kill, destroy, and hunt down the infidel wherever you find him to bring the whole world under subjection to Allah. Also take note that in 1900 A.D. Islam controlled approximately 15 countries in the world, and today Islam is 52 countries. They have achieved this primarily through peaceful immigration and high birth rates until they have enough numbers to commit violent overthrow and genocide like in Turkey, Afghanistan and other countries. A true believer of Islam who wants to conquer the world and kill Infidels will smile, and shake your hand, and maybe even dress like you, and speak English. They will treat you with respect, and work next to you, and maybe invite you to dinner and prove to you that they are peaceful people….until they don’t. You cannot tell the difference between a good person who happens to be Muslim and a true believer who is planning to kill you. That is why I always take someone at their word when they say that they believe the Quran. You cannot trust them because they are trained to lie, and you cannot tell the difference between one that is lying and one that is sincerely a good person. 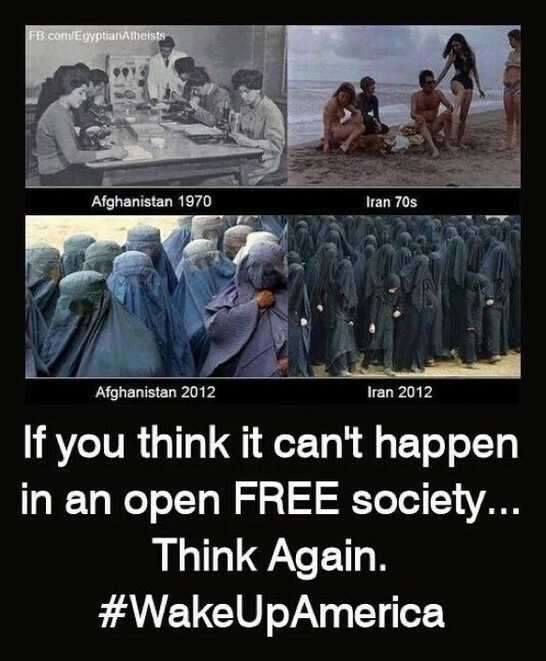 Islam is not compatible with ANY free form of government. Islam is NOT compatible with Women. Islam is NOT compatible with Jews. Islam is NOT compatible with gays. Islam is submission, not freedom. Muslims that preach PEACE are not telling you that Mohammed taught peace only to those deserving of it, and in the Quran, only Muslims are deserving of peace. To Islam, world peace will only be achieved when the whole world worships Allah.